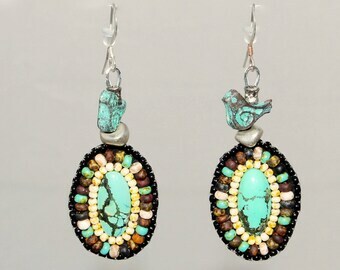 This piece won the Fire Mountain Gem 2013 Seed Bead Silver Medal GRAND PRIZE. 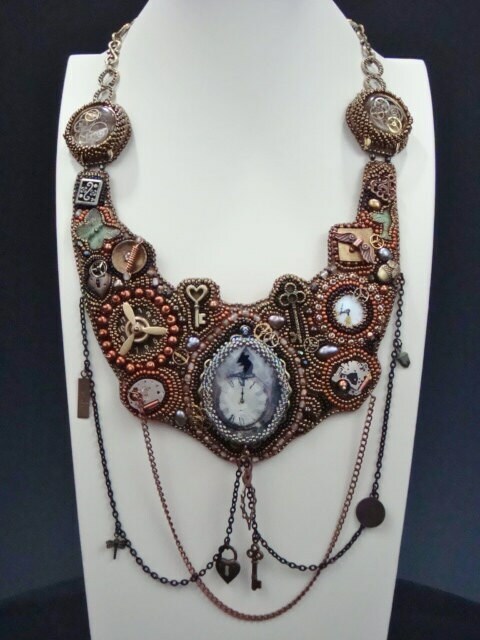 One of a kind necklace with tiny collectable do dads, gears, bits and pieces, sure to be the center of attention. The centerpiece is a timely cabochon of the classic mouse running up the clock adorned with pearls, tiny bronze, black and copper seed beads and arranged in a Steampunk like manner. Chain connects the main bead work with embellished see through watch faces exposing gears and not the expected face. Draping chains with attached charms finish this piece off. 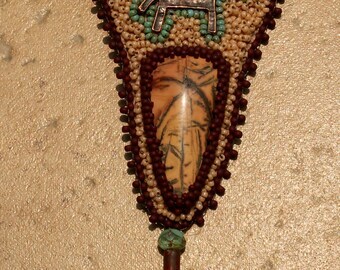 Necklace is 20" around neckline and backed with camel Ultra Suede.